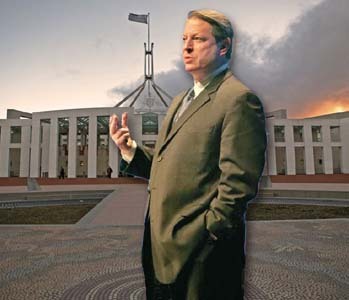 An Inconvenient Truth Down Under - It's highly symbolic that former US Vice-president Al Gore named his movie Inconvenient Truth, and that he followed the movie's long-planned and impeccably timed release with a trip not only to Australia, but also to China - the two countries that in with the USA, have refused to sign the Kyoto protocol. While 2005 showed the highest climate balance disturbance in known modern history, 2006 rapidly developed into the year that climate change became the common cause accepted by all - with the exception of John Howard. "Australia is in deep trouble as the juggernaut of US multinationals sets about making money from tackling climate change across the globe." "The move has been swift; one minute we were in the passenger seat with the US, now we are caught beneath the wheels." "No one should be surprised that the US is driven by vested self-interest and global economic power - why would it be any different on climate change?" "The globalization of the trend towards carbon-constrained economies has left Australia behind whilst we continue to operate in a carbon-bloated economy that is getting fatter every day." On this page, two articles from New Matilda's policy platform, both of them outlining a serious indictment on Australia's relationship with our climate crisis. "The objective of the Australian government under Howard is not primarily to avoid meeting its obligations under Kyoto or to 'opt out'. The real driver, and the reason it has joined the US in failing to ratify, is that it wishes to sabotage this international agreement. Australia's policy under the Howard Government has been to attempt sabotage, not just of Kyoto, but of any international climate change treaty or protocol that 'works'." :::CALL TO ACTION::: Monday 18 September 2006: A Planetary Emergency: Earth on the boil - this week, of all weeks in the year, seems a most opportune week to send you Project SafeCom's 'brand-new' publication - the brochure "From Climate Change to Climate Justice". 5 March 2006: Silencing the climate change prophets - ABC Four Corners lifts the lid off government gagging of those who know and should tell us. "Some scientists believe that there'll be more environmental refugees. Is that a possibility?" - "I can't really comment on that..."
15 September 2005: Friends of the Earth Australia: A Citizens Guide to Climate Refugees - While the Earth has always endured natural climate change variability, we are now facing the possibility of irreversible climate change in the near future. The increase of greenhouse gases in the Earth's atmosphere from industrial processes has enhanced the natural greenhouse effect. Corin Millais is Chief Executive of the Climate Institute, set up with a philanthropic gift of $10 million to raise public awareness on climate change. Prior to this he was Chief Executive of the European Wind Energy Association (EWEA), the world's largest renewable energy trade association. In 2005 the annual wind energy market was worth A$18 billion. He was also Director of the European Renewable Energy Council (EREC), and founder and European Director of the Global Wind Energy Council (GWEC). Around the world the climate is shifting and so is the global warming debate. There's a new momentum across science, technology, politics, business, media coverage and community attitudes. The Climate Institute documented these trends in a report released in July, Top Ten Tipping Points on Climate Change. The public release of the Al Gore movie An Inconvenient Truth is further proof that global warming is a hot topic. Hollywood has given an emotional punch to what has been viewed as a complex subject. The movie is unlikely to compete with Pirates of the Caribbean 2, but its emotional pitch will strike a chord and bring new people into the debate. The Climate Institute will partner with Westpac on Tuesday in Sydney for a private screening of the movie with more than 100 members of the Australian corporate community. Beyond the box office, the most powerful message is barely on the screen - a strategic shift in the position of the US, and international business, that has so far gone unnoticed in Australia. While Australia continues to focus on President Bush's opposition to the Kyoto Protocol we are wrongly interpreting this position as one of inaction by all of the United States. US Republicans from California Governor Arnold Schwarzenegger to Senator John McCain are calling for action. Governor Schwarzenegger has agreed to the country's most ambitious plan to cut greenhouse gases in his state of California, one of the world's biggest economies. Governors of seven north-east states established the first mandatory cap-and-trade program to control emissions in the US, to stabilise power plant emissions through 2015 and reduce emissions by 10% by 2019. The mayors of some 284 US cities have pledged to cut emissions of greenhouse gases through the US Mayors Climate Protection Agreement, which calls for cities to meet or beat the US emissions reduction target in the Kyoto Protocol, a 7% reduction below 1990 levels by 2012. Twenty two American states have ordered utilities to obtain as much as 33% of their electricity from renewable sources within the next 10 years. The world's largest retailer, Wal-Mart, announced a US$500 million climate change commitment including initiatives to reduce greenhouse gas emissions by 20% in seven years, and increase truck fleet fuel efficiency by 25% in three years and double it in ten. Australia has for years taken the view that action on climate change here is futile without action by the largest economy and largest emitter in the world - the US. Strangely, now that this is happening, the Australian position remains the same. The US shift on climate leaves Australia politically and economically isolated, not just as the only other major developed country that has not ratified Kyoto but also as the least-prepared developed country in the world on this issue. The safe position under the wing of the White House that Australia nestled in for so long is gone. So far few commentators have noticed. Some, though, can see the writing on the wall. Westpac CEO David Morgan referring to a conversation with the General Electric CEO Jeff Immelt summed up the mood in the US when he said, "He said to me he was virtually certain that the first action of the next President of the United States, be it Republican or Democrat, would be to initiate urgent action on climate change." Carbon has a price, it is profitable and global companies are setting the pace. The uniquely Australian notion that reducing greenhouse gases harms economies and corporate profits is being blown out of the water by a surge in corporate activity to exploit the upsides of climate change. Companies around the world are using climate change as a strategic business driver across not only emissions reductions, but also the development of new markets, technologies and investment opportunities. Previously, corporate leadership on climate change has come from Europe and Japan. Now it is global and coming from the US and developing countries as well. Some are surprised that the global response is, to a large degree, being driven by business. For example, there is a rush to invest in clean energy, a global market now worth $74 billion. The global carbon market was worth $13 billion last year and grew to $18 billion in the first half of this year. The projected technology investment for greenhouse abatement in developing countries by 2012 is $133 billion under the mechanisms of the locally-criticised Kyoto Protocol. The proof that economic benefits can sit alongside reducing greenhouse gases is highlighted by the recent Business Roundtable report signed by six leading CEOs. One would assume that the CEO of Westpac has a firm grasp of the economic realities of Australia. In his film Gore links two important partners at the hip - America and business. "There's a sea change underway in American business. What's different in business audiences in the past year or so is a new and widespread receptivity, a keen awareness, an eagerness on the part of large numbers to find out how they can take a leadership position. And a recognition, too, that there are profits to be made." Australia is in deep trouble as the juggernaut of US multinationals sets about making money from tackling climate change across the globe. The move has been swift; one minute we were in the passenger seat with the US, now we are caught beneath the wheels. No one should be surprised that the US is driven by vested self-interest and global economic power - why would it be any different on climate change? America, then China, then what? There is growing evidence that China too is following in America's footsteps. China is set to spend US$220 billion on renewable energy over the next 15 years. That kind of money would buy an oil firm the size of Chevron with change left over to fund the current renewable programs of all Europe's top oil firms for 25 years. This week I spoke at a renewable energy conference in Canberra with Zhengrong Shi, ironically Australia's first solar billionaire. He left Australia as the renewable energy industry was being shut down. He is now building solar factories in America as well as in China. Chinese wind companies are launching IPOs in international markets. The globalization of the trend towards carbon-constrained economies has left Australia behind whilst we continue to operate in a carbon-bloated economy that is getting fatter every day. So the first question I will ask the business audience on Tuesday is; can a movie have an impact on investment choices? Skeptics will claim the movie is typical, left-wing green rabble-rousing stuff that won't make an impact on the Australian public beyond the latte-drinking fringes of Leichhardt. Too late, as establishment America is gathering pace in the war to fight climate change, and shifting direction without us noticing. Gore's global warming crusade and some Hollywood magic can only highlight the economic pain that Australia is bringing upon itself through its inaction. This is a lonely and expensive place to be with the Americans no longer by our side. That is the inescapable truth of this movie for Australian audiences. For a free copy of The Climate Institute's Top Ten Tipping Points on Climate Change report, go to this location at the Climate Institute. Before his retirement, Barry Naughten had been a senior economist with ABARE, specializing in technology-based energy systems analysis. Currently, he is a PhD scholar at the Centre for Arab and Islamic Studies (CAIS, ANU, Canberra, from which university he has Masters degrees in Economics (1986) and International Relations (2004). 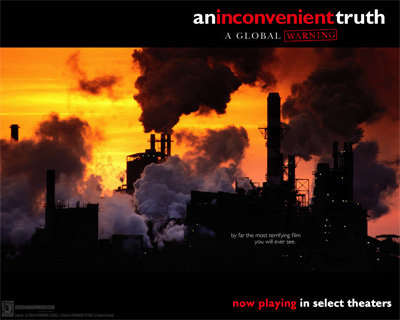 Those who have seen Al Gore's film An Inconvenient Truth were once again reminded that only two of the countries involved in the Climate Change negotiations leading up to and following the Kyoto Protocol (now almost a decade old) have refused to ratify that agreement. Those two 'recalcitrant' countries are of course the US and Australia. In addition, these two governments (both supposedly wedded to the magic of the market) have attacked the Protocol's core principle of capping and pricing emissions - the use of the market mechanism to reduce emission levels at the least possible cost of implementation. Back in 1997 there was much debate about the apparently generous deal that Australia got out of Kyoto as a result of the skill and hard bargaining of its negotiators. By now it should be evident that this debate was a bit beside the point. The main point is not that Australia refuses to meet its own domestic emissions target, or that this target was an especially lenient one. The truth is uglier than this. The objective of the Australian government under Howard is not primarily to avoid meeting its obligations under Kyoto or to 'opt out'. The real driver, and the reason it has joined the US in failing to ratify, is that it wishes to sabotage this international agreement. This is worse because it seeks thereby to undermine the efforts of other countries to reduce their greenhouse gas emissions by the most cost-effective means. However, neither of these programs quite nailed this ugly truth, though the latter's revealing interviews with the spokesman for the export coal industry did get close. a commitment, so far minor, to R&D spending on adaptation to unrestrained global climate change (rather than mitigation of causes) - but within Australia only, and ignoring wider implications even just for Australian welfare and security (for example, implications of unrestrained global climate change in producing 'environmental refugees'). Each of these characteristics is important but the 'underlying strategy and purpose' of Howard's climate change policy remains elusive . As is well known (and often resented) around the world, Australian diplomats, almost ten years ago now, extracted a 'generous' arrangement for this country under the Kyoto Protocol. This supposedly took the form of a lenient greenhouse gas emissions target that allowed Australia (unlike most participants) an increased level of emissions by 2012 (in fact by as much as 8 per cent above 1990 levels), by allowing the inclusion of carbon 'sinks' such as would result from reduced land clearing  and by allowing international trade in emissions certificates. The latter two arrangements would have the effect of allowing the domestic energy sector (the main national emitter) to increase its emissions potentially by well over the allowable 8 per cent compared with 1990. The Protocol also included a total of six types of greenhouse gas emissions, going well beyond the carbon dioxide that is emitted from combustion of energy. However, the particular deal that Australia got back in 1997 under Kyoto is not the central issue. In the Federal Government's thinking, the meeting of a domestic target for greenhouse gas emissions was probably always a second order matter. In fact, in terms of managing domestic politics, a harsher deal than Australia got from the Kyoto Protocol would have made it easier for the Howard Government to spuriously 'justify' to the public its decision not to ratify that Protocol. Further, it should be acknowledged that (like the inclusion of a comprehensive range of greenhouse gases) the inclusion of carbon sinks, at least in principle, was an important administrative advance - although there are major measurement and monitoring difficulties in its implementation. Similarly, the international trading of emissions permits is sound economics. Unfortunately, even among some environmentalists of good will, the importance of achieving emission reductions at least possible cost is not always recognised. Further, such least cost solutions should also be sought on a global scale, as would be encouraged by making emission certificates tradable internationally. Why is seeking the 'least cost' solution so important among the infinite number of possible approaches to achieving a given abatement? This is because the scale of the required abatement actually required to stabilize atmospheric emission levels by, say, 2050 is so great - far in excess of that achievable under Kyoto. Hence, it is important that the associated cost burdens be reduced as far as possible for a given level of abatement. If, instead, particular interest groups successfully promote to government their own emission-reducing but high cost technologies, other more cost-effective approaches to abatement will necessarily be squeezed out. Avoiding such costly distortions is a major benefit from using market instruments such as tradable emissions permits or carbon taxes. For example, economic modeling experience suggests that limited supplies of natural gas are far more effectively used in generating electricity instead of using coal, rather than in artificially inducing the use of gas instead of oil-based transport fuels by exempting the former from fuel excise. This is partly because the use of gas in combined cycle gas turbines is far more benign in terms of greenhouse gas emissions than is coal (as both Flannery and Lowe acknowledge). Just 'opting out' - or sabotaging Kyoto? What is the core strategy and purpose of Howard's climate change policy? It has less to do with Australia's domestic emissions than with emissions in other economies that result from their use of coal - and Australian export coal in particular. This is an important distinction that is often not fully understood. The Howard government is thus obsessively concerned about the supposed impact on the Australian economy when other countries strive to meet their emissions targets under a global agreement such as Kyoto. But will the Australian economy actually suffer in the event that the growth of its export coal industry moderates in response to the implementation of global greenhouse gas emissions constraints? This is by no means clear. First, unlike say many of the OPEC states, Australia has a great diversity of commodity exports. Coal is important but far from all-important to the economy of the 'lucky country'. Second, as a side-effect of market-driven contraction of coal export revenues, benefits will accrue to these other Australian export-oriented industries: including to natural gas (LNG) which is far more benign in terms of its effects on climate change. Third, Australia's support of effective action to reduce global emissions will of course reduce the extent of climate change - the effects of which would be suffered within Australian territory itself, by current and future generations of Australians. To refer to the Australian government's current position (and that of the US) as 'jointly sabotaging Kyoto' is perhaps too restrictive a characterisation. More accurately stated, Australia's policy under the Howard Government has been to attempt sabotage, not just of Kyoto, but of any international climate change treaty or protocol that 'works' - to the extent that such an arrangement adopted globally would reduce the profits of Australia's export coal industry . Thus, it is no surprise that the Prime Minister has positioned himself as a 'climate change sceptic' (Four Corners August 28). John Winston Howard is an active participant in the 'history wars' and seems concerned about his place in history. Taking a world-historical 'long view', Howard's page in the history books will be marked by a charge of global sabotage. Under the protocol, apart from Australia, only Norway (+1%) and Iceland (+10%) were allowed emission increases compared with 1990 levels. New Zealand, Russian Federation and the Ukraine were not required to reduce emission levels below their 1990 levels. The Protocol also envisages international trade in emission rights so that, as a result of such trade, states may legitimately choose to meet targets more stringent or less so than those specified. Baker, R, 2005, 'How big energy won the climate battle', The Age, July 30. The focus on the coal industry is important here. On the other hand, increased exports of LNG from Australia's natural gas resource would very likely assist the world in meeting more stringent greenhouse gas emissions targets, as fueling an important 'bridging technology'. This is at least the case to the extent that the share of gas-fired combined cycle gas turbines (CCGTs) is increased relative to coal-fuelled electricity generation, notably in China and India. Such use in electricity generation, whether in Australia or overseas, would be far more environmentally benign (and in the latter case, also profitable) to the Australian economy than forcing the use of excise-free gas into the Australian private transport sector. On this latter point, see Naughten, B., 2006, The political economy of transport fuel bills, New Matilda, 18 August.